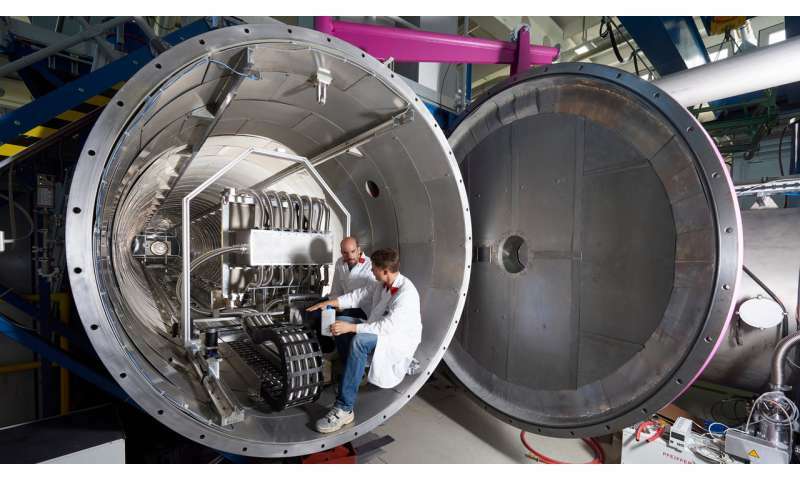 A team of researchers affiliated with several institutions in Germany has found a second skyrmion phase in a sample of Cu2OSeO3. In their paper published in the journal Nature Physics, the group describes how they found the second phase and the implications of their results. Skyrmions are magnetic anomalies found in some materials. They appear as vortices with magnetic moments that rotate 360 degrees in a plane. They were first discovered approximately 10 years ago, and since that time, have been studied by scientists seeking the basis for a new type of electronic media storage—one that could pack much more data in a smaller space than today's technology. 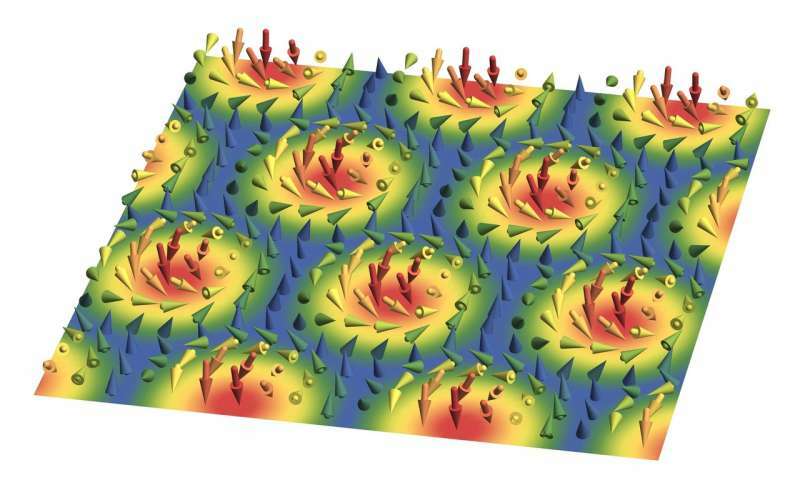 Skyrmions have been found to exist in a wide variety of materials, the researchers note, but only within specific parameter ranges, such as temperature or field range. Such constraints have serious implications, the researchers also note, because of the impact they can have on their suitability for manufacturing purposes. Until now, such constraints have limited the phase of skyrmions to a single one for any given material, which has restricted their use as a data storage option. In this new effort, the researchers report that they have discovered a second skyrmion phase in one material. This finding, the researchers report, shows that at least some materials can have more than one phase, which greatly improves the outlook for using them as highly dense storage mediums. The group notes that they found the second phase by accident—one of their team members was investigating the properties of Cu2OSeO3 when it was exposed to different temperatures. Further study revealed that the phase could be stabilized at the same time as the previously known first phase, but by another mechanism. They discovered it came to exist at a low temperature in a border area between a conical phase and a field polarized state. All it took was the application of a magnetic field along one axis. The researchers suggest their discovery offers hints that it might be easier to generate skyrmions than has been thought. If so, that might mean researchers could generate them in a wider variety of materials—perhaps some that are good candidates for storing data. But, they also note, more work needs to be done to see if a means exists for switching between the two phases. 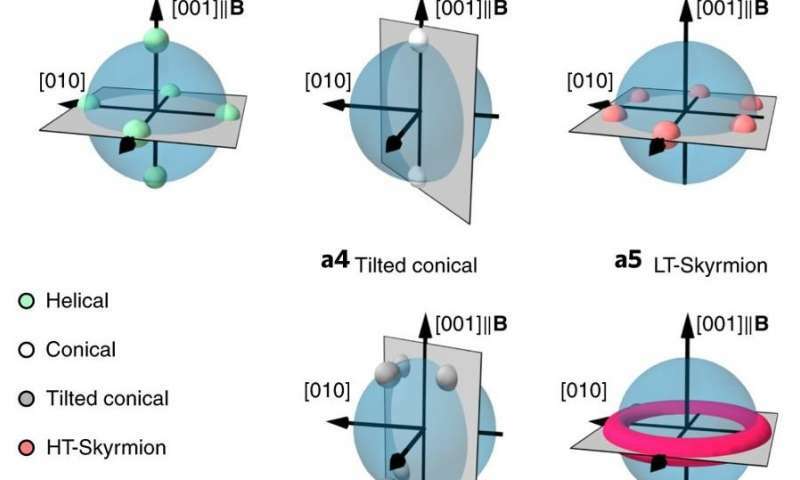 Magnetic materials can host skyrmions, which are topologically non-trivial spin textures. In chiral magnets with cubic lattice symmetry, all previously observed skyrmion phases require thermal fluctuations to become thermodynamically stable in bulk materials, and therefore exist only at relatively high temperature, close to the helimagnetic transition temperature. Other stabilization mechanisms require a lowering of the cubic crystal symmetry. Here, we report the identification of a second skyrmion phase in Cu2OSeO3 at low temperature and in the presence of an applied magnetic field. The new skyrmion phase is thermodynamically disconnected from the well-known, nearly isotropic, high-temperature phase, and exists, in contrast, when the external magnetic field is oriented along the 〈100〉 crystal axis only. Theoretical modelling provides evidence that the stabilization mechanism is given by well-known cubic anisotropy terms, and accounts for an additional observation of metastable helices tilted away from the applied field. The identification of two distinct skyrmion phases in the same material and the generic character of the underlying mechanism suggest a new avenue for the discovery, design and manipulation of topological spin textures.